Today our website moves to gov.uk. This means that online information will be simpler, clearer and easier to find. We’re closing down our old website. But don’t worry – any content which didn’t make the move to GOV.UK will still be available via the National Archives website. 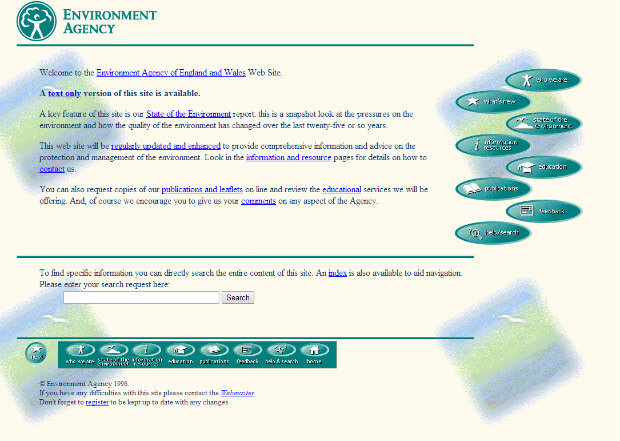 Our website has gone through many changes since it launched in 1996. A look back through the archives shows how, with the development of new digital technologies, our online services have changed. 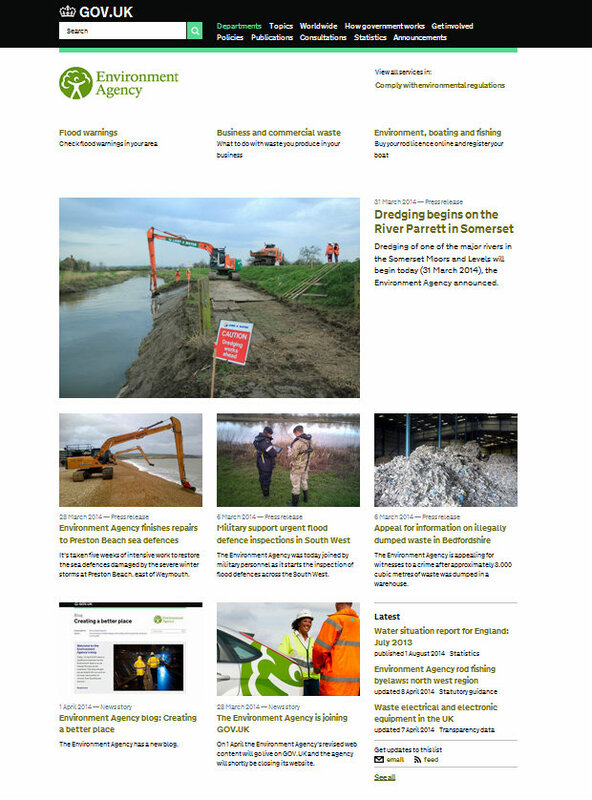 Live flood warnings, online consultations, social media and video streaming were allusive concepts when the Environment Agency was first created. Now they’re an integral part of the service we offer to our customers and we can barely imagine how we coped without them. The rate of change has been astounding – during the last three months over 7 million people visited the Environment Agency website. It is the source of live flood warning information for communities, businesses, journalists and emergency services across the country. It also provides vital services to farmers, industry and landowners who complete thousands of online transactions through the Environment Agency every day. Each and everyone of these services means that our customers know what to do to protect and improve the environment. In the last couple of years we’ve extended our digital services to provide live flood alerts via Facebook, Twitter Alerts, video content and live web chats. All of these services rely on reliable, accessible content on our website. Moving to GOV.UK has accelerated this development. We’ve reviewed and rewritten thousands of pages of content to make it more accessible, mobile friendly and easier to understand. All of the information on GOV.UK must meet the needs of our customers. Our popular online services won’t change. This includes flood warnings, the electronic public register and consultations. We’re also moving our ‘What’s in your backyard?’ tool which gives you access to maps showing your local environment, pollution levels, flood risk, sites of interest and river levels. Today’s move is the culmination of a year-long project which has seen us re-evaluate the way we share information online. Over 75 online services have been moved to GOV.UK. And it doesn’t end here. Further improvements are being planned to make our information more accessible and user friendly. If you have any ideas for how we can continue to improve our digital services, tweet us @EnvAgency or leave a comment for gov.uk. Pam Gilder is the Environment Agency’s Director of Corporate Affairs. She oversees our communications, media and business planning teams. Noooo!!!!!!!! The EA website was annoying and the search facility was rubbish but the gov.uk is even more difficult to use and finding what you need is almost impossible. Deeply disappointed. You have made the working lives of lots of professionals so much more difficult. I note that whereas previously details of all the preliminary flood risk assessments were provided these are not linked on the new website. When you search for PFRA's you get a link to an archive site and this simply returns an error when you click on the relevant PFRA. Is there a program to transfer the PFRA links and if so when is this likely to be completed? Would like to thank you for clearing the sunken boats from St Albans Riverside at Hampton. No illegally moored boats at present. So nice to see the general public enjoying the space in the summer - walking, sitting on the bank eating icecreams or whatever and enjoying looking out at the river and what an impovement to my view. Long may it last! Sue Beck.